As of late, Across Tundras' clever take on sludge and doom metal has certainly been appreciated amongst the Neur-Isis disciple bands. The band's previous record took a robust helping of the standard stoner metal ingredients and blended in dashes of country twang, vintage rock, and folk undertones to create a unique combination of raw heaviness with a western psyche. Lonesome Wails from the Weeping Willow, their debut release for Forgotten Empire Records, showcases the band's ever increasing attention to detail, as the trio's sound is filled out with a wide range of traditional folk instruments (mandolin, slide guitar, etc.). These elements, though present on Western Sky Ride, permeate each and every track, allowing LWFTWW to represent the bands most unified and fluid record yet. LWFTWW also displays a bit of a step away from Neurosis and Black Sabbath-type songwriting styles toward a sparser sound more akin to a blend of Earth and Neil Young. While the latter pair of influences was certainly instrumental in the musical mood of Western Sky Ride, they have moved to front and center on this release, pushing the stoner metal elements to the rear. In fact, many of the heavier moments of LWFTWW aren't necessarily heavy at all--they've got much more in common with 70s psychedelic rock than anything that would be classified as a traditional metal. 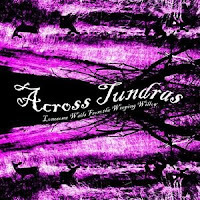 So while the cohesiveness of this record is extremely impressive given the wide range of influences, many sludge/doom metal fans may find that Across Tundras has evolved to where they no longer sit on the edge of the genre. But that's not to say that this album couldn't still appeal to this fan base. "Blackbird Sanguine Sky" and "Cold Earth Death Scrolls" both feature fantastic slow-moving chord progressions, vintage rock licks, raw drumming, and vocals buried deep in the mix--all of which could draw numerous comparisons to the songwriting mentality of many doom bands. Even the opener, "Before the Rooster Crows" exhibits an impressively dark mood through somber acoustic guitar work and murky ambiance. However, the great folk influence of tracks like "Lonesome Whistle Blues," "Lowlands Low & Thunderstorm Wa," and "Requiem for Luke the Drifter," represents quite a sizable songwriting shift from the band's last record. But alas, the band pulls it all together with ease, so listeners more inclined toward spacey vintage rock, or simply those tired with the often limited variety amongst doom and sludge releases will have no trouble getting into this. Dissapointing... I was expecting a lot more after their previous records, specially Western Sky Ride, which is a masterpiece.